The copper mining industry began on the Keweenaw Peninsula in the 1840s. Lake Superior’s unreliable disposition meant that passing ships needed navigational assistance, and in 1851 the original lighthouse was built. The wooden tower which supported a fourth-order Fresnel lens illuminated by a sperm oil lamp soon deteriorated, and in 1871 it was replaced by the present red brick structure. In 1895 a fog signal was added. 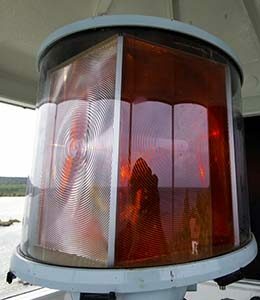 In 1968, the original lens was replaced by aviation beacon-type white and red lights, which beam their warning to ships more than 20 miles offshore. After being tended by 21 keepers over a 129-year history, the lighthouse became automated in 1980. The current LED equipped, electronic, light found at the top of the tower lacks the romance of the Fresnel lens but is much more efficient. Since 1982 the Keweenaw County Historical Society has maintained four museums at the light station. Besides the lighthouse, they include a Maritime Museum in the old fog signal building, a Keweenaw History Museum located in the old U. S. Coast Guard Station garage, and Commercial Fishing Museum located in one of the assistant keepers buildings. In 1999, Congress transferred ownership of the Eagle Harbor Light Station to the Keweenaw County Historical Society. The U.S. Coast Guard continues to operate the light at the top of the tower. 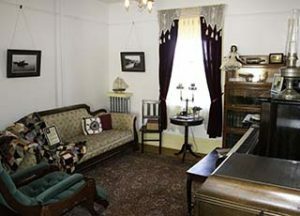 Care has been taken to decorate the inside of the lighthouse, including the parlor shown here, in a 1930’s style, when electricity first arrived at the lighthouse. Hours & Admission – The Eagle Harbor Lighthouse and museum complex is open from mid-June to early October. Admission $5.00. Children free. See the Site and Museum Schedule page for specific hours of operation. 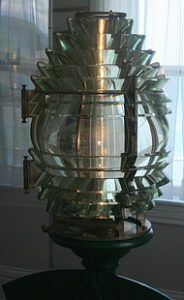 Related Links – You may wish to explore the following sites for additional information additional information about the Eagle Harbor Lighthouse. Need a map? Click on this small Google Map to open a larger version that will give you complete access to a larger Google map of the area, satellite view, etc. You may use this link to go to Google Maps Help if you are not familiar with Google Maps.